Mackie has had a pretty huge year. The company not only launched an all new MR series, including the awesome new Mackie MR824 speakers, but it also expanded the much-loved Big Knob series with three new monitor control devices — including the Mackie Big Knob Studio. 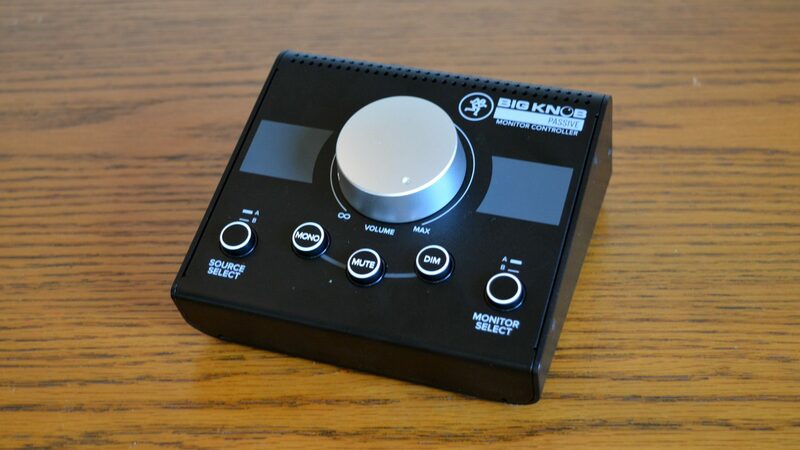 The Big Knob Studio scored excellently in our review, and for good reason. Now, we’re taking a look at its smaller sibling, the Mackie Big Knob Passive. 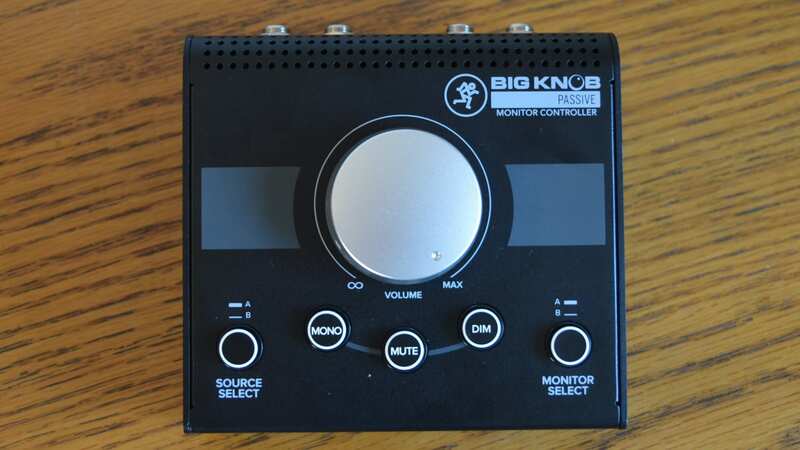 The Big Knob Passive seems to be an excellent choice for those looking to gain a little control over their monitor setup at a much lower price than other monitor control systems. How much does it cost? A tiny $69.99. We took a look at the device to see how it performed at that price point. The first thing you’ll notice about the Mackie Big Knob Passive is its design, and it’s a good-looking device. It follows the same design style as the Big Knob Studio, though obviously on a smaller scale. The main attraction here is the “big knob” on the front of the device, which covers a pretty large percentage of the main panel. 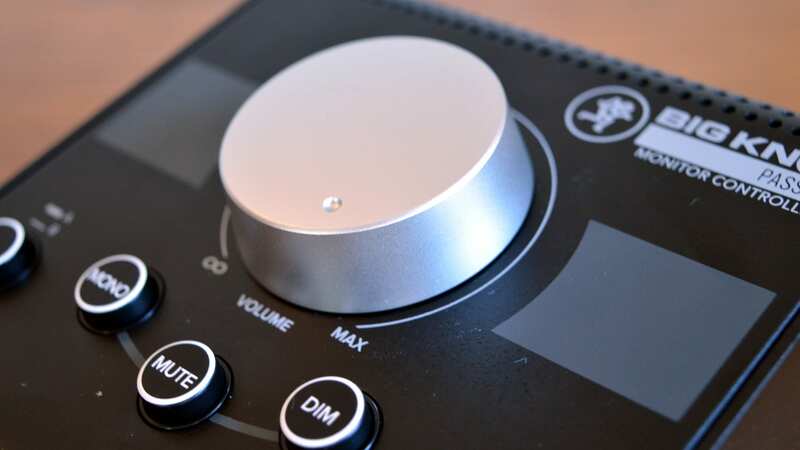 Apart from that and the black-painted metal frame, you’ll also find a source select button, with two options available; mono, mute, and dim buttons, and a monitor select button — which again offers two options. That’s really all you’ll find on the front of the Big Knob Passive, but that’s kind of the point here — it’s made to be simple and easy-to-use, and at an affordable price. On the back of the device, you’ll find all the corresponding inputs and outputs, including two stereo 1/4-inch source inputs, two stereo 1/4-inch monitor outputs, and a stereo 1/8-inch line input, which can be used in place of the second stereo source input. So what’s missing from the device? Well, compared to the Big Knob Studio there are a few things, but notable is the fact that the Big Knob Studio can function as a recording interface. We wouldn’t expect the Big Knob Passive to be able to function as an interface, especially considering its price point, but if you are looking for an interface as well it might be worth looking into the Big Knob Studio. One thing that would have been nice is a headphone jack, though we assume that it wasn’t included because the device can’t power headphones thanks to it being passive. Speaking of passive, you’ll notice there’s no power input — which is because the Big Knob Passive doesn’t need one. It does mean you will need to make sure your other devices — headphone amps and speakers — are powered, but most home-studio-quality audio products are. 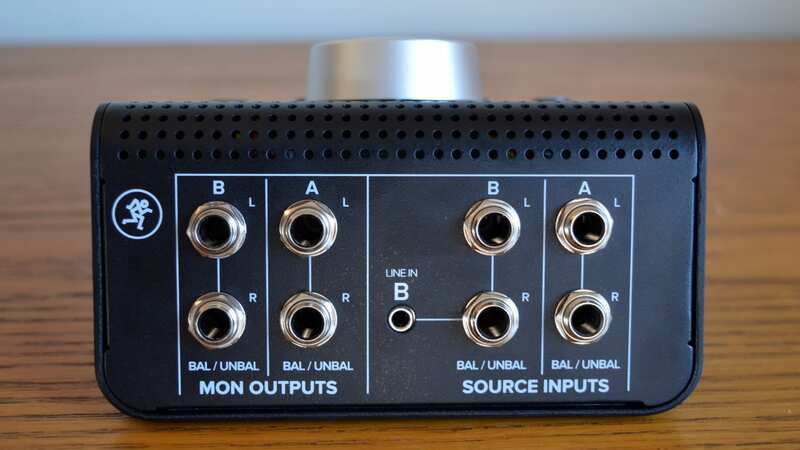 The Big Knob Passive, as the name suggests, uses passive circuitry, which means that the output signal will be extremely close, if not identical, to the input signal. That’s a good thing for audiophiles out there that want something that won’t color their sound at all while monitoring. Now, some user reviews indicate that the Big Knob Passive does result in a volume loss, but after testing that we found it to not be the case — and if it is true the volume loss is very negligible. Because the Big Knob Passive is passive, the actual volume knob has to be turned all the way up to get the same volume as your source — but that shouldn’t be too much of a problem. Simply turn your source up if you want more control. That doesn’t mean you won’t get more gain out of the Big Knob Studio or Presonus Monitor Station V2 — you will. But that’s because those devices are powered and hence offer more ways to boost the gain. Other devices boosting gain is not the same is the Big Knob Passive implementing a loss. In general, the Mackie Big Knob Passive sounds great — but we would expect nothing less from Mackie. The Mackie Big Knob Passive is an excellent way to introduce some control into your small studio’s monitor setup. While some will find the two input/two output setup limiting, for most small studios it should be more than enough. It’s well-designed and easy-to-use too, which is always a plus. The best thing about the Big Knob Passive, of course, is its price. In fact, this would still be the best monitor control system for the price if it came at $100. But it doesn’t — it’s only $69. You can pick up the Mackie Big Knob Passive for yourself using the links below, or check out our review of the Mackie Big Knob Studio if you’re interested in the Passive’s slightly more capable sibling.